Dr. Susan Corbridge is the associate dean for practice and community partnerships in the College of Nursing at the University of Illinois at Chicago. 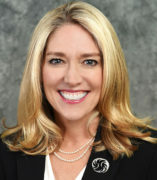 As leader of the College’s Institute for Healthcare Innovation, she is responsible for the development and maintenance of faculty practice, including fiscal accountability and operations of all faculty practice sites, including the College of Nursing’s nurse managed clinic, Mile Square Health Center – Humboldt Park. Dr. Corbridge facilitates interdisciplinary models of care and provides strategic vision and leadership to promote the integration of student education, clinical practice and research. Dr. Corbridge is a board certified Acute Care Nurse Practitioner and maintains a clinical practice in the Department of Medicine, Division of Pulmonary, Critical Care, Sleep & Allergy Medicine. She has published widely and lectures nationally and internationally on pulmonary topics and interprofessional practice and education. Health Resources and Services Administration (HRSA), Bureau of Health Workforce Division of Nursing and Public Health Nursing, Nurse Education, Practice, Quality, and Retention – Interprofessional Collaborative Practice, $999, 988, PI. Smith, CD., Landefeld, S., Harter, R., Opelka, F., Sandy, L., Sinsky, C., Fried, J., Sato, L, Corbridge, S., Legreid Dopp, A., & Martin, C. (2018). Implementing Optimal Team-Based Care to Reduce Clinician Burnout (National Academy of Medicine Discussion Paper). 2010, Nurse Educator of Illinois Award, NEI. Nurse Organization of Nurse Practitioner Faculties. Institute of Medicine of Chicago.